The primer in any round of ammunition is the place where it all begins. The brilliant flash produced by the primer is what ignites the powder charge, which in turn produces the gas that forces the remaining charge, wad, and bullet out of the cartridge and down the barrel on its way to the target. Primers come in many sizes and styles, but the rifles used for Long Range BPCR, in general, require large powder charges. Therefore the cases used for Long Range BPCR have primer pockets that are designed to accommodate Large Rifle Primers. Determining which primer is right for your rifle and the bullet/powder combination you are using is a key factor to developing a successful load. I would like to start off by saying I don’t use pistol primers in my long range BPCR rifles. My advice would be to use them at your own risk. First of all, they don’t fit a large rifle primer pocket. They are shorter in height resulting in a too deeply seated primer that the firing pin may or may not reach (depending upon firing pin protrusion). The fact that a pistol primer is shorter in height than a rifle primer virtually guarantees that it will slam back against the face of the breech, possibly doing eventual damage after repeated use. A simple and easy way of obtaining better round-to-round ignition performance is to uniform the depth of the primer pockets on all your cases using a tool specifically made for that purpose. Another operation that can result in more consistent ignition is to remove the internal burrs that are sometimes left as a result of the manufacturing process. The flash holes in most cartridge cases manufactured in the U.S.A. are made by punching the flash hole, rather than drilling the hole, as you might expect. The Sinclair Model DB-1000 Flash Hole Deburring Tool does an excellent job, and also places a slight chamfer on the inside edge of the flash hole. Primers are a sometimes thing, meaning that what works for one rifle/powder combination may not work for another. Flash hole size, the amount of powder compression used, as well as the internal condition of the brass case (smooth or rough), can affect primer performance. Thoroughly cleaning the inside of your cases using ceramic media and a cleaning solution in a rotating tumbler can only offer positive results. Sometimes just changing to a different primer can open-up or significantly reduce the size of your groups. It has been my experience that standard primers work best for me. Some time ago, I tried match grade primers, both standard and magnum, but ended up going back to my standard non-match primers. No matter how many tests and comparisons I did, I was never able to exceed the level of performance attained by using standard large rifle primers. Maintaining consistency in your loading techniques, loading components (i.e. bullet weights and orientation, cases, powder charges) is necessary to get the best performance out of any load you produce. Developing standards for the way you test your loads or prepare for a match will pay dividends down the road when the pressure is on and time is running out. 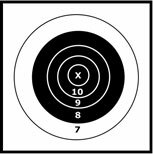 Your bullet will not find its way to the target by itself, so…… go out and get some range time. It’s the one place to find out what your limitations are, and a great place to test your loads. Once you have developed a consistently accurate load combination (tested at Long Range) stick with it and get to know its limitations (i.e. wind deflection-trajectory) and use it for competition. Most of the match champions that I have competed against use the same load combination wherever they compete.